One of the most common challenges participants in mediation training have is temptation to push the parties towards looking at solutions much too early in the process. As the neutral third party with no emotional stake in the issue, the solution seems obvious. But if the solution was that easy to find, then the parties wouldn’t need a mediator in the first place. 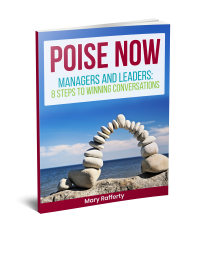 Here’s one of my favourite tools that you can use in difficult conversations of all kinds, whether you’re the mediator or trying to deal with a difficult issue yourself. Take a dispute between Janet and Tina who share an office. Janet feels that Tina cherry-picks the tasks she likes, leaving her to do the boring and tedious filing and statistics. Tina feels Janet never does her share of the lunch time reception cover. Janet likes the place tidy and orderly, Tina sees Janet as a ‘control freak’. Argument and counter-argument get pitted against each other. Alas, these questions only serve to elicit further defensive responses… each one listing off several reasons why the way they are viewing the situation is the ‘right’ one. Back to Einstein’s quotation above, what would be a more useful question to ask that might lead towards solving of the problem? 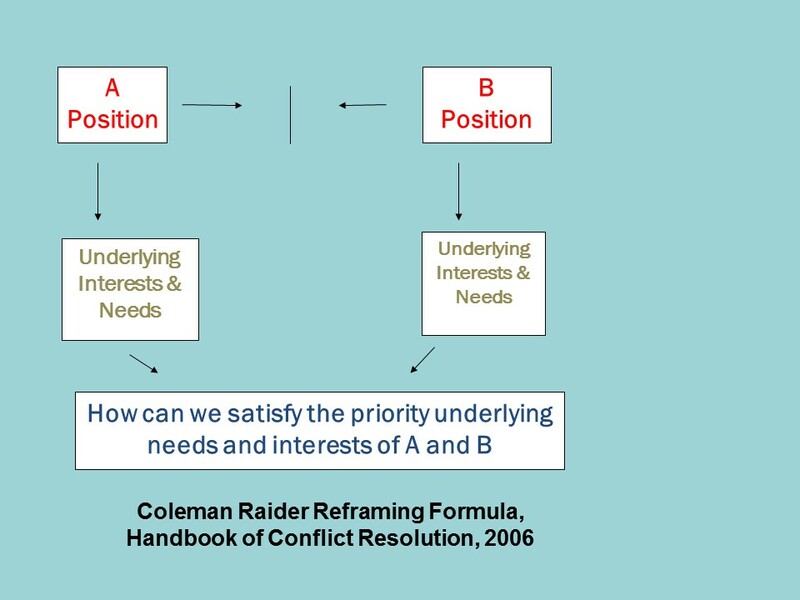 The Coleman Raider Reframing Formula is one of my favourite tools for helping people stuck in problem (re)iteration mode. 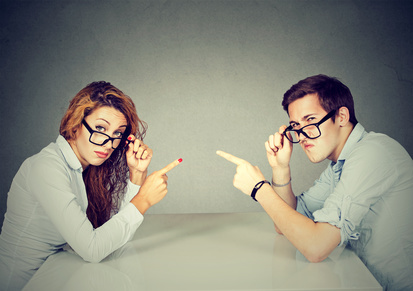 Parties come to mediation each of them with their position or fixed viewpoint (usually) about what the other one should do to improve the situation. Rather than trying to get them to move from this position, the mediator’s job is to probe for the meaning underpinning their stated arguments. When Janet says ‘It’s not fair that Tina cherry picks all the nice tasks and I have to do the boring ones’ it’s not immediately obvious what’s really at the heart of this complaint statement from Janet. Is this about fairness of division of labour, a dislike of filing or is it about not being given any choices? Similarly, with Tina’s statement about Janet being a control freak, the mediator has to help Tina understand for herself and express to Janet, what’s at stake for her in this aspect of Janet’s behaviour. Only when the mediator has elicited each person’s underlying concerns and needs can an effective question about problem-solving be posed, as per the formula below. This question has changed the frame of the problem and invites them to consider it from a collaborative and mutually inclusive rather than exclusive point of view. Yes, it might have taken 55 minutes to get to this point but it’s a much better place to try and resolve the issues between Janet and Tina than trying to reconcile competing and polarised positions. Emails…Are you Trigger Happy? Read this Before You Press ‘Send’ Relationships that Endlessly Frustrate: Can the Dynamic Be Changed?